Eleven years ago almost to the day, I was joining the long queue of students at a Leicester stationers waiting to get my dissertation bound. The discussion topic: Is the notion of making the arts accessible to the widest range of people an achievable aim or just an admirable and worthy sentiment? The questions raised from this undergraduate research propelled me into seeking employment in arts education, and subsequently community and youth arts. Each role has been focused on ensuring people have the opportunity to engage in and foster the life enrichment that the arts can offer regardless of their experience or education. I joined THSH in 2007 and am proud to say I work for an organisation which through it’s charitable aims, genuinely strives to engage with the widest range of people. THSH’s mission of ‘connecting people to music’ provides a clear ambition for much of the charitable work we undertake here. We value all music equally just as we view all people equally; our challenge is to change perceptions, break down barriers and find ways for people to engage in the right way for them. Music Picnic roadshows see musicians that play in the monthly free Musical Picnic at Symphony Hall tour children’s centres in the preceding week. Every month we’re seeing more and more families who have never been to THSH join us as a result of this outreach programme. Science of Sound and Tiny Tours are introductory events for primary school age children. Science of Sound introduces the magnificence of Symphony Hall through the exploration of sound, while Tiny Tours invites children to become detectives as they investigate Town Hall’s musical history. There are great offers and discounts for schools, students and groups, as well as free events, which ensure that opportunities for young people to come to concerts are widely available. The Concerts Inside Out scheme enhances this through complimentary learning activities bespoke to individual groups. The Patrick Music and Media Studio facility offers opportunities for young people and adults who are often facing challenging personal circumstances. Programmes delivered with these groups can often lead to a qualification such as Arts Award as well as improving health, happiness and future aspiration. The Generation Ladywood initiative has grown out of four years of community outreach work in the district in which our two venues are based. Previous education projects and box office data provided evidence that those people living in walking distance were not engaging with our programme. An extensive programme of enriching musical opportunities is currently being delivered in the 14 Primary schools of the Ladywood Consortium. 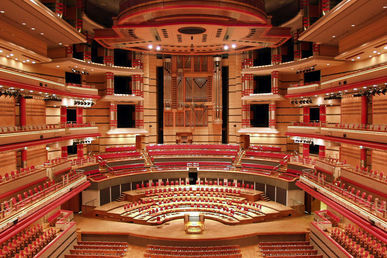 Through on going partnership with the schools and families we are ensuring that the children attend performances, learn to play an instrument, sing together, make music with professional musicians and celebrate their achievements in a concert at Symphony Hall. Over the coming years we will continue to work with the schools, families and residents of Ladywood to enrich lives and bring the community together. The debate around access has moved on since my time as an Arts Management student, but I am assured through first hand experience that lives can blossom and transform through the enrichment that a connection to music can offer.